No returns for unsold or excessive stock will be accepted. Minimum order of 12 carry boxes. All RRPs are recommended retail prices only and you are not obliged to sell the products at the RRPs. 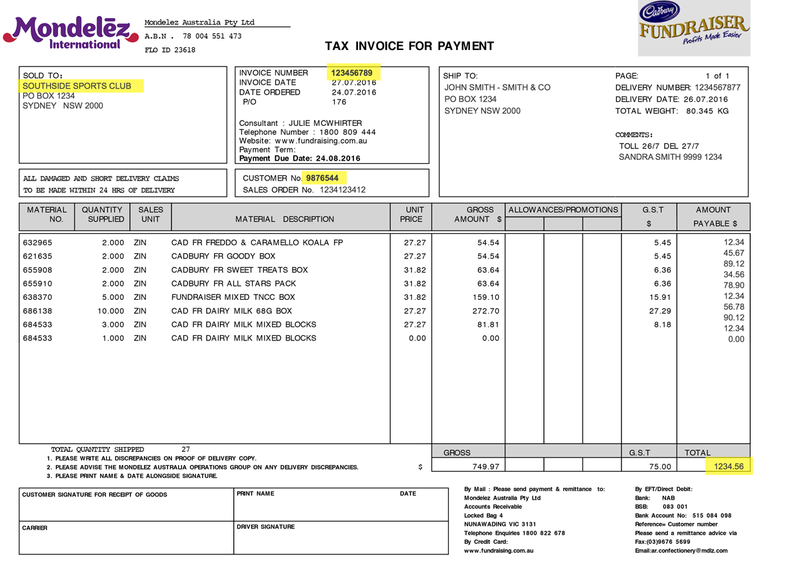 Product specified within mixed boxes may change; replacement product will be of equal or greater value. Free delivery Australia wide for orders of 12 or more carryboxes or the dollar equivalent of $288. All sales are subject to credit approval, payment is 28 days from delivery for orders of 12 or more carryboxes or the dollar equivalent of $288. The information, including pricing and product details, contained in the Cadbury Fundraising website, catalogue or order forms may include inadvertent and occasional errors due to typographical mistakes, miscommunication and technical glitches. Cadbury Fundraising reserves the right to cancel orders and refund customers' money due to these errors on the website, advertising material or order forms. Terms and Promotions may be updated from time to time without prior notice, Cadbury Fundraising recommends checking at the time of ordering or go to fundraising.com.au for more details and the most up to date terms and conditions. Please talk to your Cadbury Fundraising Consultant for more information on any aspect of our sales. It’s important that you tell us when you’ve paid your invoice. Do this by emailing or faxing us a remittance, which is a written advice to Cadbury Fundraising that you’ve paid your account, outlining the details of the payment. Southside Sports Club, Customer number 123456 has today paid $500 into your account for invoice number 78910. 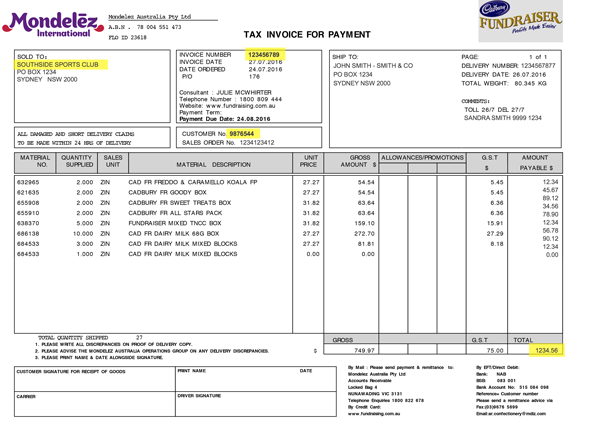 Send the remittance to the email address ar.confectionery@mdlz.com or fax to (03) 9676 5699. You should also tell your local Consultant that you have paid your invoice. You can find their contact details here. The picture below illustrates where to find your customer number and invoice number on your invoice. A credit card surcharge of 0.84% of the payment amount will be charged to the card.